Madam Zobo Luther on her farm. In Liberia, agriculture constitutes a significant fragment of the country's economy. More than two-thirds of Liberia's population are involved in subsistence agriculture, using very rudimentary but outdated technology. 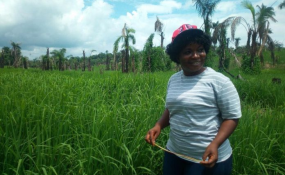 Zobo Luther, armed with a Master's degree in Agronomy and Plant Breeding from the Kwame Nkrumah University of Science and Technology in Ghana, said she purchased for herself 75 acres of land upon completion of her studies in 2015 and she has so far cultivated 15 acres with a variety of different cash crops. "I intend to cultivate the entire land with different cash crops including perennial crops like oil palm or cocoa," she disclosed. "Women make up much of the farming workforce, but they have not comprehended their economic influence alongside their male counterparts" Miss Luther emphasized. "When women have equal access to on-farm assets like land, labor, extension, and credit for other inputs, this can increase agricultural yields, which in turn leads to increased income," Luther explained. "But being a young woman in a sector perceived as male-dominated has its challenges," Luther admits. She told this reporter that the argument among men is that increasing women's access, control and ownership of land will lead to stronger bargaining power and higher income and would also serve to strengthen women's "voice" within households and communities. Madam Luther maintained that access to market remains a challenge for most smallholder farmers in Liberia. Poor and impassable roads, lack of storage facilities and lack of market links between farmers and buyers are among factors hampering farmers' efforts. "My dream is to supply the country with vegetables in the coming years," she concluded.